Easycooking: Vegetable Cutlets ~ Udupi Diana Style!! I recently joined a group on Facebook called Konkani Amchi Food.Someone sent me an invite and I joined casually.I am a member of quite a few groups on facebook but seldom do I peek into the group discussion or photos.Even otherwise Fb takes up lots of my time:).But this one is different.It is more a photo group where the members post pictures of Konkani dishes as well as new,innovative dishes. Our dining table has seen a lot of variety after I joined the group,seriously.Thanks to KAF,I made Tori bendi and Palak pathrodo.While browsing through the recipe corner,I came across this recipe for Cutlets.Ajay is a big fan of cutlets and fondly remembers the way his mother made it for them during his school days.I tried his mom’s recipe here and we both loved it.But I try to cut back on deep fried snacks and hence this did not feature in our menu for a long time. Ajay vividly remembers the Cutlets from Diana restaurant in Udupi and since the recipe sounded pretty easy,I decided to try it out after all.I was in a good mood and hence the step by step pics:). Heat oil in a kadai and add green chillies and garlic paste. Saute for a minute and then add the chopped onion. When the onion starts turning light brown,mix in the grated carrot and beetroot. Add garam masala and salt to taste and mix well. Cook on a low flame till the water evaporates and the mix becomes dry. Let it cool and then mix in the mashed potatoes and bread pulp. Make small balls of the mix and flatten it using your palms. Keep it in the fridge for a while to firm up. Make a paste using ½ a cup of water and maida. Dip the flattened discs first in the maida-water and then roll it in the bread crumbs. Arrange on a plate and refrigerate for 2-3 hours. Heat oil in a kadai for deep frying the cutlets. [Make sure the oil is really hot before putting in the cutlets]. Add the cutlets to the hot oil and fry till they become dark brown on both sides.Serve hot!! So so delcious, i want to grab them it is almost lunch time here. Lovely cutlets! They look perfect! 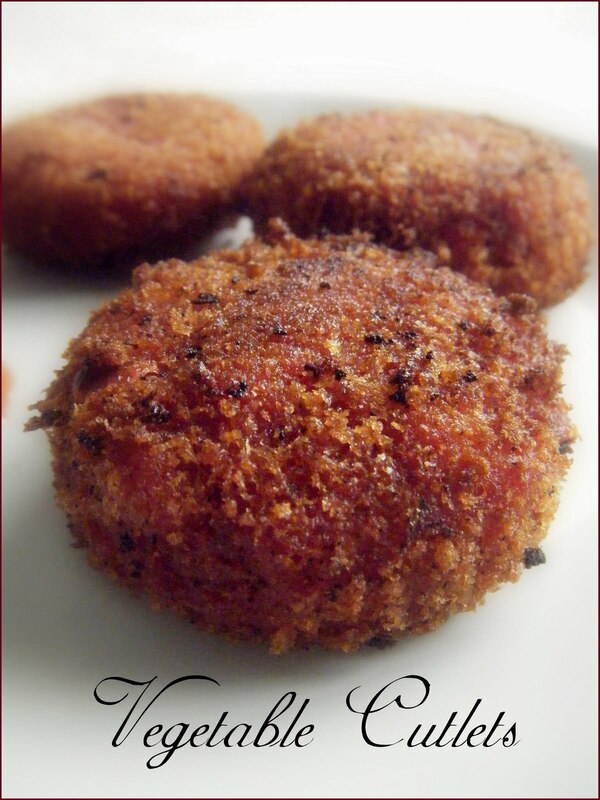 Crispy cutlets looks fantastic and prefect.. I liked the idea, dipping them in maida solution before dipping in crumbs. Cool! Have been an avid follower of your blog. Diana Cutlet takes me for a swift walk down the memory lane. I gobble many when I visit Diana. Kudos to your recipe. Thanks for sharing. These look crispy and delicious.Love the step by step pics too. Divu, Diana was a place we frequented during vacations only wt cousins for a popular dessert 'Gadbad' must hv had other dosa or regular item, not this..tks for sharing such a lovely recipe! Omg! They look so crunchy! Even I feel like making them! YUMMM! what a lovely idea to use the bottle cap! Ahh yummy that last picture seems like it's just been served to me, to eat! Wish I had some of this! Hey Divya, r u a Konkani??? Amgilve? I have been past by Diana restaurant, but never tried these. Need to try them now that u have them on a post here. Nice recipe with step by step photos. I just recently made these and blogged about it for a friend who wanted red cutlets like they serve in Indian restaurants. Keeping it in the fridge is a great idea to firm up the cutlets! Loved your post! Wounderful idea for the shape,luks very tempting. nice recipe..looks delicious..its always fun in exploring our traditional cusine..
Hey the tawa-fry version comes out equally good. Very less oil used for bhajofying..
divya, i tried it and posted on my blog. Thanks for the Perfect Recipe!! thanks for posting... this came out amazingly yummy !